Renewable energy generation in the United States, specifically wind and photovoltaic solar, have been incentivized in a variety of ways since the 1980s. One of the most effective incentives is a Net Metering agreement that allows power producers to “bank” excess power. When a PV system generates more power than is consumed locally, the energy is put back on the grid (net export) and the producer is paid for this energy with credits that may be applied during times when the consumer needs to draw energy from the grid (net import). These agreements, along with the introduction of renewable energy credits and flexible customer financing options, have created the necessary economic incentives for distributed renewables and gave rise to the grid-tied systems that dominate the market today. Solar deployment is continuing to grow rapidly, even with falling energy prices for oil and gas. According to the PV industry group Solar Foundations, there was a 22% increase in jobs created in 2015 while oil and gas employment decreased by 13%. Bloomberg New Energy Finance reports that last year 121 Gigawatts of renewable energy capacity was added with the US investing $56 billion in renewables. Worldwide more investments are being made in renewable energy than all of the fossil fuel generation sources combined. While rapid growth is good news for the solar industry and helps the world progress toward a cleaner future for power generation, it can and has at times created stability problems for the electric grid. Renewables such as photovoltaic solar and wind are intermittent energy sources; the energy from these generators is not continuously available and cannot be dispatched to meet power demands. The electric grid is able to accommodate a certain amount of intermittent power, but if the percentage becomes too high, it can have negative effects on a utility’s distribution components and even becomes difficult to maintain system stability. Efforts to manage the growth of renewables has taken three primary directions: smart grid upgrades, cost-shifting infrastructure upgrades, and reducing or eliminating the benefits of net metering. Forward-thinking regulators at the California Public Utility Commission (CPUC) have brought together a number of the interested parties to solve challenges that the state faces with large scale adoption of renewables, particularly photovoltaic solar. Together they have planned out a multi-year solution that relies on a more intelligence generating system in a scheme known as California Rule 21. Central to this plan are smart grid generator systems that allow power producers to dynamically adapt their power output to maintain grid stability and allow utilities some degree of control. As one might expect, this control comes with a level of complexity. Typically hundreds to thousands of data points are collected and managed and must be under supervisory control to ensure the health and proper operation of the PV system. Across the country in cases where the utility believes that the grid will need to be upgraded, regulators have generally given utilities significant leeway to shift infrastructure costs to the power producer. Often utilities require power producers to procure equipment, which the utility will then install. The costs of protection equipment, transformers, and even reconductoring circuits can easily push the economics of a project beyond what makes sense and often effectively force a project to be downsized or outright canceled. For sites with significant power loads, limiting net export may make a project viable if it means avoiding infrastructure upgrades. Larger buildings with significant HVAC requirements may experience high electrical load on work days and very little load on weekends. Controlling the net export allows the PV system to be sized larger and protects the grid from high levels of power generated on a few cool, bright weekends in the spring and fall when PV systems are often operating at their peak. With the exception of the PV panels and DC conductors, most of the rest of a PV system has a non-linear cost curve, meaning it does not usually cost much to make the system incrementally larger. In fact, inverters are often de-rated at the manufacturer, without reduction in cost. For sites with seasonal irradiance, the effect of increasing the DC system size can yield increased ROI as more energy is generated for most of the year with a relatively small increase in cost. Another growing aspect of smart grid initiatives are energy storage systems. Energy storage technology is progressing and expected to become significantly less expensive over the next few years as volume increases. As local energy storage capacity increases and the need control net export increases due to high PV penetration levels, many sites will avoid infrastructure upgrade costs by managing generated power in intelligent ways. Systems will need to charge and discharge storage systems based on realtime economic data, system maintenance requirements, and local grid conditions. This increased complexity will often justify upgrading from a manufacturer’s basic control to a Supervisory Control and Data Acquisition System (SCADA) providing increased reliability, customizability, and flexibility; a comprehensive alarm system; and ability to interface to most any type of hardware or upstream system (Modbus, DNP3, IEC61850, BACnet, web services, etc.). Finally, a significant number of states are beginning to limit PV export as a matter of policy, largely in response to utility concerns. Arizona limits net export to 125% of power load. Massachusetts and about a dozen other states limits systems to 25kW net export. Many states are also in the process of changing their net export tariff rates from the retail electricity rate to the wholesale rate, putting renewable energy on par with traditional generation sources. The net effect of these changes is to encourage more complex generation systems and specifically local energy storage development. SCADA systems are already managing smart grid functions on systems deployed worldwide. Projects of this type are typically point solutions, with purpose-built applications for a particular PV or wind farm. This has been necessary because the information required to manage the export of energy varies depending on the manufacturer, and in some cases the model of inverters, meters and storage systems that are used on any given project. The result of such custom integration is it is cost effective only for larger power generators. A standard approach is needed. Fortunately such a standard has been developed. The SunSpec Alliance is a trade alliance of over 70 solar and storage distributed energy industry participants, together pursuing information standards to enable “plug & play” system interoperability. These standards define the schema that determines the organization, structure, and meaning of data that can be used to interoperate with a piece of equipment. Using these standards a supervisory system can write commands to the specific registers that control a smart grid function, for example to curtail output of the inverter. Working with PcVue Inc. of Woburn Massachusetts, we are now able to define a Controlled Net Export (CNE) system without the need to know which inverter and smart meter will be deployed. As long as manufacturers have incorporated the SunSpec Alliance standard, it is possible to automatically integrate heterogeneous equipment with a standard supervisory and control system. This allows Independent Power Producers (IPP) who manage multiple PV farms using different equipment to have a consistent supervisory system to manage all of their farms. It is also to the benefit of Public Utilities to have a standard method by which to send curtailment commands or changes to the power factor. The DNP3 protocol, which has been mapped to the SunSpec standard, is the preferred method for most utilities in North America and is supported within the system. In collaboration with PcVue Inc., we are defining the meta data that defines a CNE system abstracted from the inverters and meters. PcVue has developed automated tools to provide the bridge between the abstracted project specification and the supervisory system and controller configuration. We expect to be able to automatically configure 90% of the system using this approach. This greatly reduces the cost of the CNE system due to the fact that a large part of the cost of current solutions is the engineering costs of a point solution specific to one site. Tom Johnson is a Massachusetts based consultant specializing in PV system development, energy services, and SCADA. He was formerly the Solar Monitoring Product Manager for Solectria Renewables where he oversaw the development of utility communications systems for their smart grid inverters. He was one of the first implementers of the DNP3 User Group AN2013-001 standard, which defined SCADA control for smart inverter functions including connection control, real power curtailment, power factor adjustment, and semi-autonomous functions including volt-var and volt-watt curves. PcVue Inc. located near Boston, MA is the North American affiliate of ARC Informatique. The company provides a modular, scalable SCADA platform for Energy and Intelligent Building Management. 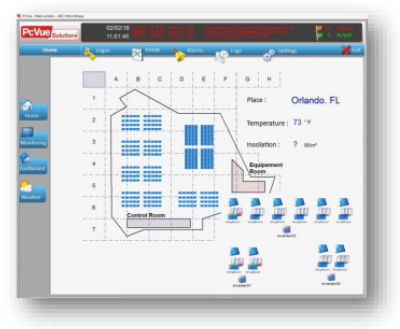 The company’s flagship software suite, PcVue Solutions is deployed world-wide ranging from management of a solar farm to supervision and control of some of the largest distributed renewable projects in the world. The solution has high value for Intelligent Building complexes and campuses that have energy management requirements. PcVue Solutions has the unique capability to use Proximity Services to provide Contextual MobilityTM to operations and maintenance workers. This highly efficient mobility solution improves quality and safety while reducing costs.